The apartment Schlossraut is for 2 people and has a very spacious living room with a large window front, beautiful kitchenette, comfortable seats, dining table and a cozy centrally heated stove bench. The bedroom with a double bed has a bathroom with a tub and WC. 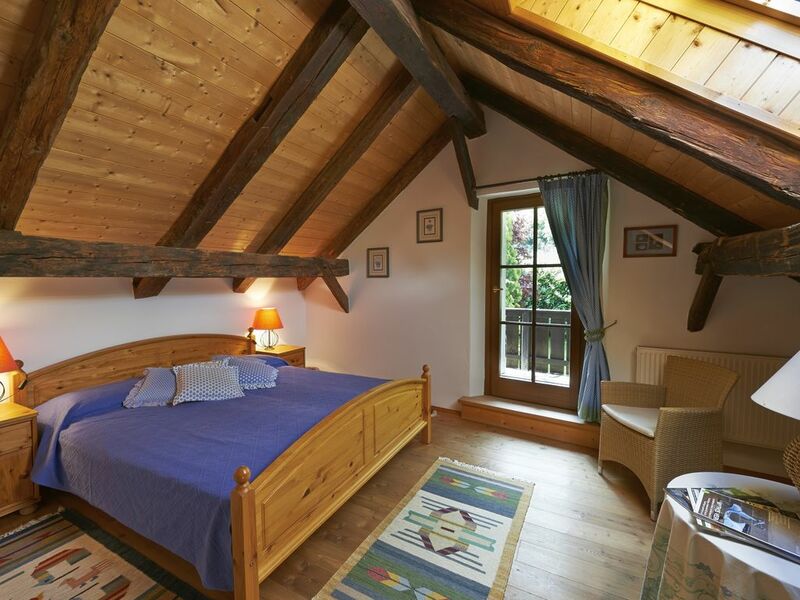 This room has a small balcony and offers a charming view of Meran and the Texel groups lying behind it. The apartment Schlossraut is a real secret. The holiday apartments are located on the Brandis estate, located in an idyllic location on the edge of Lana. The apartments have a stunning view of the blooming orchards and the Meraner Land with its powerful mountains. The apartments were tastefully furnished with a lot of detail from the lord. She personally was in charge of the furnishing and every apartment has warmth and rural elegance. The apartments are connected through a small, angled and dreamy inner courtyard. Take the chance that the near proximity to the new, beautiful 9 hole golf course of GC Lana 'Gutshof Brandis' offers you, which can be played nearly year-round. You can also combine a skiing holiday with a golf holiday, because our nearby skiing region guarantees enjoyful skiing up to spring. In the area around the Brandis estate you will find the cozy 'Alte Brandiser Weinkeller' and the golf restaurant with tasty light cuisine. Lana by Meran and its environment: The resort Lana is located in the climatically convenient bottom of Etsch between Bozen and Meran and forms the southern part of the Burggrafenamt. Lana is an ideal starting point for different holiday activities. You have the selection of a number of museums, like for example the famous Ötzi museum with the man made of ice in Bozen, the natural museum in the Tirol castle. Enjoy the new, unique to Europe, botanical gardens of the Trauttmannsdorf castle. A shopping trip through the city of Bozen with its southern flair and its inviting restaurants is a must for all south-Tirol visitors. Countless skiing and hiking regions in the Dolomites are located nearby. By the glacier ski region of Schnalstal (3,400 m) you can enjoy snow and firn until May. The Kalterersee by the wine street offers sailing and wind surfing fun during the summer months. Even day excursions to Lake Garda or Venice are possible from Lana. Important for golfers: As a guest to our apartment, you will receive a 20% discount on the green fees at the GC Lana 'Gutshof Brandis'. You will receive a 10% discount on all courses (beginners, experienced and handicap courses) at our golf academy 'Chris Mawdsley'. The apartments are completely equipped with dishes and laundry. *** New: Nespresso coffee machines *** direct by the area of the Brandis estate you will find the cozy 'Alte Brandiser Weinkeller' and the golf restaurant 'Gutshof Brandis' with tasty light cuisine. Die Wohnung ist sehr schön und gemütlich eingerichtet. Wir haben uns gleich wohl gefühlt. Alles vorhanden und sauber. Telefonischer und persönlicher Kontakt dort sehr freundlich. Empfehlenswert. Lieber Gast, vielen Dank für Ihre Bewertung. Wir freuen uns sehr, dass Sie sich in unseren Apartments wohlgefühlt haben und Ihnen das Angebot am Gutshof Brandis gefallen hat. Wer die Vorteile eines Appartments mit denen eines Hotelaufenthaltes kombinieren will, ist auf dem Gutshof Brandies an der richtigen Adresse. Die Appartments sind liebevoll eingerichtet und bieten eine Individualität, die der Urlauber in Hotels so nicht findet. Die zwei Restaurants sind ebenso wie der Golfplatz keine 100 Meter von den Appartments entfernt. Das Essen ist lecker und das Personal ist sehr hilfsbereit. Alles ist top sauber und sehr gepflegt. Lieber Gast. Vielen Dank für Ihre treffende und positive Bewertung . Wir freuen uns sehr, dass die Einrichtungen am Gutshof Brandis Ihren Wünschen entsprachen und zu einem gelungenen Urlaubserlebnis beitragen konnten. Lana by Meran (260 m above sea level) is located in the heart of South Tirol in the middle of expansive apple groves and vineyards and has a comfortable, mild alpine climate. Lana can be reached comfortably through the highway exit Bozen-Süd and then through the freeway to the exit Lana. Golf: The apartments are very peaceful, directly on the 9th hole, par 35, golf course GC Lana 'Gutshof Brandis'. All historical buildings are located under the burg ruins and the Brandi castle. Embedded in one of the most charming landscapes in Europe, directly in the heart of the alps, you will find a new golf course. A few steps from your apartment you can go to the golf club Lana where they combine fun with nature: from one green to the next, almost year-round. The area appears to be perfect for a golf course: all facilities are located near each other. The driving range, the club house with its restaurant, the pro shop and the panorama patio, from which you can watch the 1st tee off, offer pure golfing fun. Between vineyards and apple trees, you can hit on to the green. Finally, also important for golfers is the right ambiance. The view of the player reaches from the bizarre Dolomites to the Meran mountains and to the lovely apple trees and the attractive vineyards. Golfing in a southern landscape with charm. Due to the convenient climatic conditions with a lot of sun and mild temperatures, you can play the whole year-round from February to December. Starting 2004, three more beautiful 18 hole courses can be reached in a 45 minute drive. Haustiere auf Anfrage. Kosten pro Tag 10,- Euro. Mindestaufenthalt vom 01.05.-04.06. 3 Tage und vom 01.08.-22.10. 5 Tage. Bei kurzfristiger Buchung sind auch kürzere Aufenthaltszeiten möglich. Bei Aufenthalten bis zu 3 Tagen berechnen wir einen Zuschlag von 10 %. Die Stornobedingungen entnehmen Sie bitte unserer Webseite www.gutshofbrandis.com. Wir empfehlen eine Reiserücktrittversicherung.